Jeff Sessions imprisoned one last minority on his final day as attorney general before officially submitting his resignation letter to the President. Sessions reportedly asked his staff to hang pictures of minorities with minor criminal records onto his office wall. He then blindfolded himself and threw a dart at random. 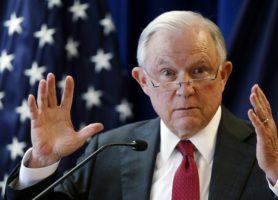 “The dart landed on a picture of a nice-looking man named Javier Gutierrez who was charged with possession of marijuana nine years ago,” Sessions said. “So we just called the law officials at his jurisdiction and gave them a warrant to search his house. Turns out he had some marijuana again, and they took him back to jail. Gutierrez’s attorney told the Flipside he was not available for comment, as he could not afford bail. But Sessions appeared unconcerned. Sessions says he plans to retire and move back to the birdhouse in his garden where he will build miniature cuckoo clocks.